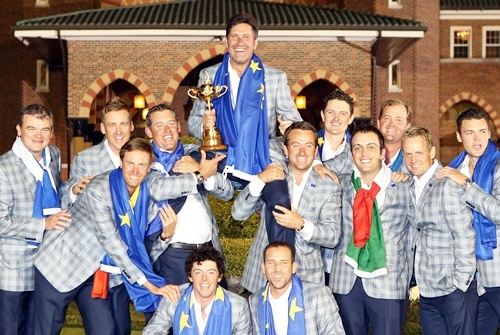 Inspired by the spirit of Seve Ballesteros, Europe pulled off one of the greatest comebacks on a golf course to beat the United States and win the Ryder Cup by 14-1/2 points to 13-1/2 on Sunday. Needing to claim eight points in the concluding singles to retain the trophy, Europe won six of the first eight encounters before Germany's Martin Kaymer secured the vital point to retain the Cup by beating Steve Stricker one up. After Stricker had coolly holed his par putt from eight feet at the last, Kaymer buried his five-footer for a matching par before thrusting his arms skywards in delight as European fans erupted with deafening cheers at Medinah Country Club. 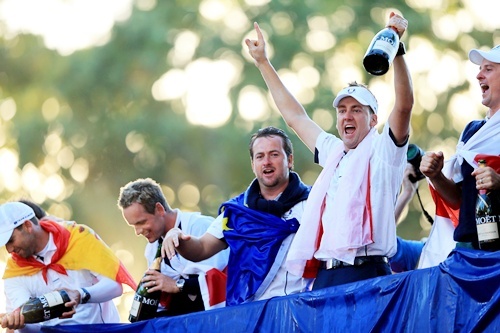 "It's undescribable," the German said as chants of "Ole, Ole, Ole" echoed across the course. "I was so nervous the last two, three holes. I loved it. It's amazing." 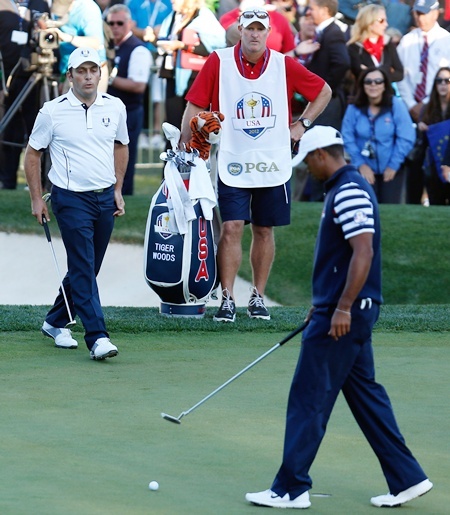 With the chance of a tie resting on the final match, Tiger Woods astonishingly missed a three-foot par putt at the 18th, then conceded a putt from similar length to halve his contest with Italy's Francesco Molinari to hand Europe outright victory. "It was already over," Woods said. "This is a team event and the Cup was already been retained by Europe." Europe, who sent out their best players early, emulated the miracle comeback achieved by the US at Brookline in 1999 when they also overhauled a deficit of 10-6 on the final day, in front of vocal home crowds, to triumph by the same margin. However Europe's astonishing turnaround, which stunned the flag-waving American fans into periods of silence in the late afternoon, will be viewed as more impressive having been delivered on foreign soil. "We believed in our hearts we could win this," said Englishman Luke Donald, who earned Europe's first point of the day in the opening match with a 2&1 win over Masters champion Bubba Watson. "It's been done before and we believed we could turn it around." The Europeans drew inspiration on Sunday from their beloved Ballesteros, who died last year aged 54 after a battle with cancer, with every player wearing the navy blue colours favoured by the Spaniard in the final rounds of tournaments. "Seve will always be present with this team," said a teary-eyed Olazabal, for whom his compatriot Ballesteros was both a friend and mentor. "He was a big factor for this event, for the European side. "Last night when we were having that (team) meeting, I think the boys understood that believing was the most important thing, and I think they did. This one is for the whole of Europe." Europe won four and halved one of the six matches that reached the 18th hole as they triumphed for a fourth time on US soil. 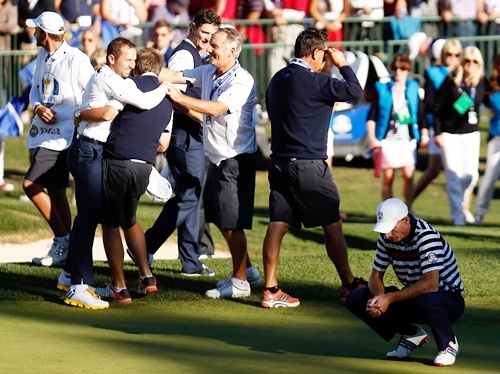 They have now won the Ryder Cup seven times in the last nine editions. US captain Davis Love III, whose team had been in a dominant position overnight when leading 10-6, was stunned by the defeat. 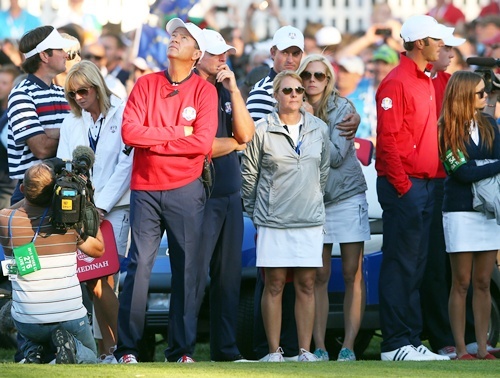 "We know what it feels like now from the '99 Ryder Cup. It's a little bit shocking. We were playing so well, everyone on our team was playing so well," he said. "I wouldn't have done anything different. They played great. We had a couple of matches get flipped there at the end that made it a little bit easier on them." Donald set the tone for Europe's remarkable final day, fending off a late fightback by Watson before ending their match on the 17th green. Scot Paul Lawrie, competing in the Cup for the first time since 1999, crushed Brandt Snedeker 5&3 before Northern Irish world number one Rory McIlroy beat Keegan Bradley 2&1. McIlroy played what he described as his best golf of the week after giving his team an early scare when making his teeoff by barely 10 minutes due to a mix-up over his starting time. Firebrand Englishman Ian Poulter never led in his match until he won the par-three 17th with a par before beating US Open champion Webb Simpson two up after conjuring a miraculous birdie from trees at the last. Poulter, whose storming finish of five successive birdies earned a valuable point in Saturday's fourballs to give Europe momentum heading into the final day, ended the week with a perfect 4-0-0 record. The first US point on Sunday came when long-hitting Dustin Johnson beat Belgian Cup rookie Nicolas Colsaerts 3&2 but England's Justin Rose then came from one down to Phil Mickelson after 16 holes to win one up with a birdie-birdie finish. Rose drained a 35-footer at the tricky par-three 17th to square the match, then coolly sank a 12-footer at the 18th after Mickelson had over-hit the green with his approach. "When it looked like I might be able to stop some of momentum on the board, they (Europe) were able to get another point," said Mickelson. "That match, as early as it was, was a very pivotal one." Though Zach Johnson and Cup rookie Jason Dufner added further points for the US after never trailing in their matches against Northern Ireland's Graeme McDowell (2&1) and Swede Peter Hanson (two up), the late momentum went Europe's way. "All went to plan. We were four ahead," Love said. "The plan worked the first two days, it just didn't work today."